For as much as we can say about high definition re-releases of video games over the last few years, for how easy a cash-in they can be or giving out judgment in regards to their quality, there’s one fact that can’t be denied: a great game from years ago can still be a great game now. Some of them even regardless of age or, on the other side of the argument, how they smell of new paint. Resident Evil is such a game. In 2002, Resident Evil received an incredible update released for the GameCube, adding much improved graphics and a slew of new gameplay mechanics. At that time, the Resident Evil franchise was already suffering in quality through the rehashing of old ideas and the addition of terrible new ones. The remake marked what would be the first major repeat release with such degree of quality. 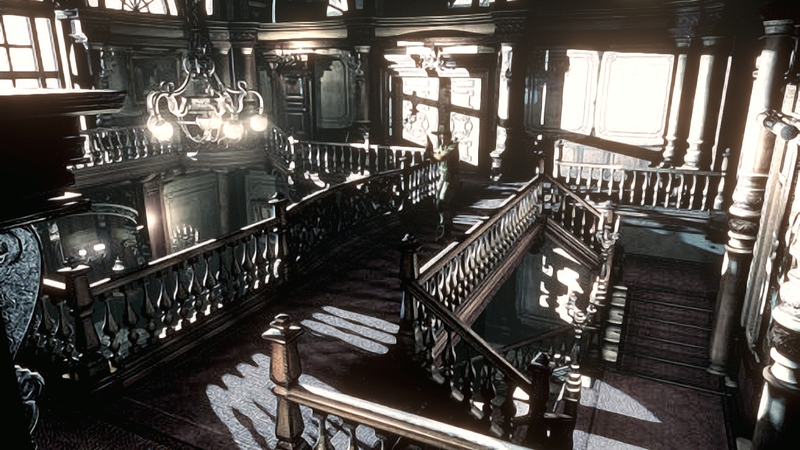 The lighting plays a huge part in the mansion’s atmosphere. Fast-forward ten or so years, and we’re back to the point where we’re seeing another release for Resident Evil. As used as we might be to Capcom’s way of dubbing their re-releases, this one is simply named Resident Evil HD Remaster. And like the “original remake” to Resident Evil, it’s still scary, tense and (somewhat) hard to predict. I was personally a big fan of remake back during its original release, and spent a decent chunk of time with it. The years following its release, I never felt as particularly drawn back to playing it again as I have now, especially due to how little recollection I have of much I have played years ago. It’s commendable works like the original Resident Evil, and by proxy, its remake, that remind us of the potential every new idea has when it’s first introduced; of how fresh something can be at first. Alternatively, it’s just as effortless to make the same assumption on how terribly susceptible that idea can be in further iterations, speaking purely on video game terms. The remake worked well within that boundary. For better or for worse, a Resident Evil game that comes about nowadays is an entirely different beast from what the very first game set out to be. Ammo and health are your most treasured commodities, due to how easily they can be spent and how rare they are throughout the game. Smart use of resources is key, as well as a keen eye on inventory space, which is also limited. Saving your game is also a decision that’s made based on limitations. Unlike most of today’s games, saving is tied to a particular item that you’ll only have a small number of throughout the game. That juggling act is Resident Evil‘s draw and at the same time its biggest obstacle. For new players, it definitely proves to be a challenge due to its ‘ancient’ conventions that, for the most part, have been done away with in games in favor of ease of use. On the other hand, there’s a genre of games today that were born from the first few Resident Evil games’ approach to challenge, like Outlast, a game that has the intent of truly limiting your options in favor of atmosphere. The remake kept that core concept alive and updated it in a few interesting ways. While most of the layout of the mansion remained unchanged, new rooms were included, as well as a few new areas that include one of the creepiest encounters seen in a game at that time. Enemies were also upgraded and made stronger, down to the lowly zombie, who can potentially turn into a deadlier foe if not properly disposed of. For many, thanks to these, the remake (and by extension, the HD Remaster) is far in a way the ultimate version of Resident Evil. HD Remaster is less of a revolution and more of a polish up. Character models were scaled up visually and look about as good as they do in current Resident Evil games. All of the pre-rendered environments have received a slight touch up in resolution, too, even though they look a little blurrier than your rose tinted glasses wearing eyes might recall. The fixed camera perspective provides a great opportunity for the updated lighting to do its thing, making a drab place like a mansion ten times scarier than it has any right to. It also bears mentioning that the much-maligned tank controls aren’t the only option to play HD Remaster thanks to the new analog option that makes character movement comparable to more modern games. Even with this added option, though, fiddling with menus to use items and equip weapons is still a hassle, considering how much of it has to be done, be it for puzzles or combat. There’s tons to praise Resident Evil for its influence to modern horror games. For as cheesy as some of its writing can be, or terrible the voice acting is, and how stiff it feels to play, there’s no denying Resident Evil, remade or not, has earned its place among video game classics. Resident Evil HD Remaster is the definitive version, now readily available.